Mario's latest adventure is the cat's meow. 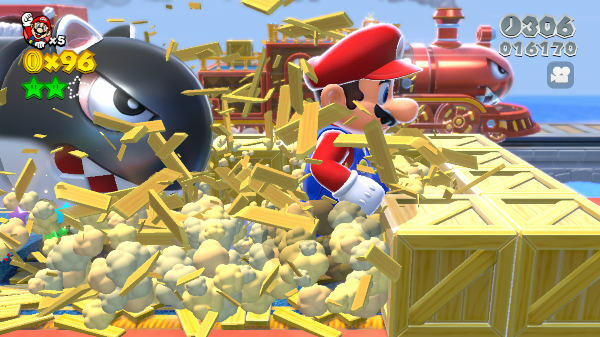 There are no guns in Super Mario 3D World – no brutal melee kills or unnecessary expletives. You won’t encounter any micro-transactions forcing you to pay over the odds, a DLC season pass, or any contrived quick-time events covering up a developers’ lack of ideas. Instead, what you will find is an eclectic ensemble of everything that makes Super Mario 3D World an essential, unmissable purchase: exceptional level design, immaculate presentation, and an uplifting display of heart-warming passion from a company that concentrates on video games – and nothing else. Super Mario 3D World isn’t here to squeeze you of every gold coin in your possession, or shock you with gratuitous scenes of violence; Super Mario 3D World has one primary objective: to put a smile on your face, and the faces of everyone around you. From the moment the title screen triumphantly appears in an explosion of colour and flying cat-Goombas, Super Mario 3D World will do exactly that. And it won’t be long before your cheeks start to hurt. Super Mario 3D World has one primary objective: to put a smile on your face, and the faces of everyone around you. Mario games always feature an achingly simple story – and that’s because unlike some other critically acclaimed titles, it’s all about the gameplay first and foremost. It should come as no surprise, then, that SM3DW employs the classic tale that Nintendo has been telling gamers since 1985: Bowser comes along, rudely kidnaps a character (in this case a bunch of fairies) and it’s up to Mario to save the abductee(s) from the maniacal claws of a dinosaur who is the epitome of evil in the eyes of every child (and subsequently, today’s grown men). Predictably, Nintendo won’t be winning any awards for SM3DW’s story, but again, Mario doesn’t need a story. It’s all about pitting the red-capped plumber in a plethora of weird and wonderful worlds, and seeing whether you can reach the flag pole at the end or nab that elusive star. But this time, Mario’s not alone. 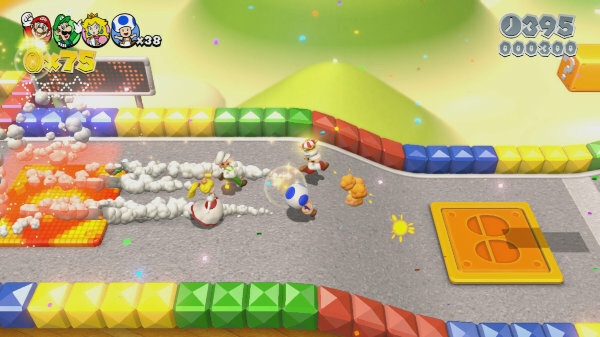 SM3DW is the first four-player 3D Mario game in existence. For many gamers who left Nintendo long ago, this may sound wholly insignificant; the thought of a four-player Mario game is something that has already been done after all, albeit in New Super Mario Bros. Wii, a side-scrolling game. But believe me when I say playing SM3DW with family and friends is an absolute blast. So much so that SM3DW is the first game I’ve been able to review entirely with my girlfriend’s help, without the experience being diluted in any way. And that’s because SM3DW’s drop-in multiplayer isn’t intrinsic to the core gameplay itself. Sure, it certainly helps having an extra pair of feet to stomp on Goombas, or an extra pair of claws to climb towards a green star, but there isn’t any needless co-op sections hamstringing the single-player experience, or vice versa. The multiplayer isn’t a tacked on mode, either, and it certainly isn’t crippled by the unreliability of servers or the uncomfortable presence of foul-mouthed strangers. Super Mario 3D World can be thoroughly enjoyed alone, or with friends – no compromises, no caveats. Simply put, SM3DW can be thoroughly enjoyed alone, or with friends – no compromises, no caveats. And that’s what makes it truly special, because the addition of multiplayer – true, fully-realised multiplayer – lets more people enjoy a fantastic game together – one mental, mushroom-eating moment at a time. Of course, it wouldn’t be multiplayer without some sort of competitive element and a selection of distinct characters to choose from. 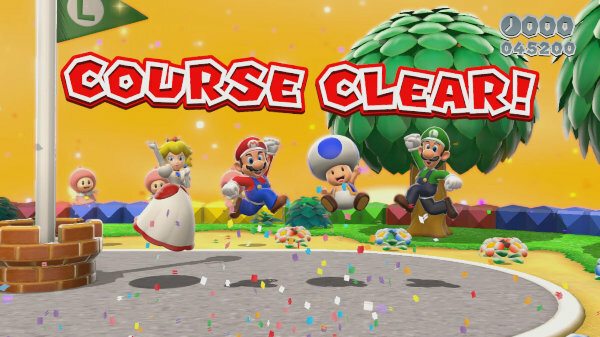 There are four playable characters from the Mushroom Kingdom, each with their own traits: Mario is an all-rounder, Princess Peach can hover, Luigi leaps the highest, and Toad can run the quickest. Thankfully, all of them look adorable as cats and raccoons (though Toad may take the prize for overall cuteness). If the top-scorer gets hit during his playthrough, or “accidentally” attacked by a mischievous friend, the crown will be up for grabs and can be stolen by any player. And it’s well worth the fight, because whoever keeps the crown atop their furry head (assuming they’ve transformed into a cat, that is) gets bonus points at the end of the level. Speaking of cats, dressing up has now become even crazier in SM3DW. Not content with becoming a bumble-bee, a human spring or a fluffy cloud in Super Mario Galaxy, our moustached hero (and other particular individuals…) can now transform into a cat. Yes, a cat – a purring, meowing, pouncing cat, scurrying along on all fours. I defy anyone not to get a kick out of the new cat suit – it’s ridiculously fun scrambling up walls and diving into enemies! Meow! I defy anyone not to get a kick out of the new cat suit – it’s ridiculously fun scrambling up walls and diving into enemies! Surprisingly, power-ups still haven’t lost their lustre, even after all these years. It’s an empowering moment whenever you don a particular outfit – and thankfully there’s more variety than ever. The double cherry duplicates your character and quickly produces on-screen bedlam. The handheld piranha plant gobbles up everything in its path. And the mega mushroom lets you obliterate any poor sucker who dares to stand in your way. The tanooki suit also returns, as do a number of fan-favourites including the fire flower. But despite the obvious power-up each costume provides, it’s remarkable how balanced and finely-tuned everything remains, regardless of what outfit you’re wearing or which level you encounter. Mario made quick work of the recycling. It’s worth noting that the levels in SM3DW are generally more confined than the expansive playgrounds offered by Super Mario Galaxy. Each level can be completed in around five to ten minutes, depending on how much searching you do, though the developers do a fine job at ensuring your journey to the flag pole is always as topsy-turvy and imaginative as it could possibly be. This may be a moot point for some, but I personally missed the freedom offered by the planetary wonders of Galaxy, and the more interactive characters such as the Lumas. Oh how I love those sweet little Lumas. 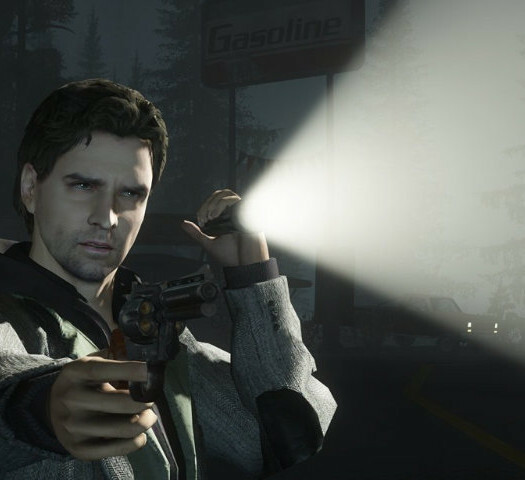 For a company who were five years late to the HD party, Nintendo have comfortably dethroned even the most graphically glamourous games produced by the Xbox 360 and PS3, and that includes many of the PS4’s and Xbox One’s launch titles. An opulent art style comes to life thanks to the clarity of high-definition, running at a silky smooth 60 frames-per-second, with searing colours and fantasy locales, bright enough to light up even the darkest of winter evenings. However, it’s the way Nintendo weave their trademark magic into every level and climatic boss battle that really leaves a lasting impression and provokes gasps of childish glee. I was frequently oohing and ahhing at the platforming puzzles that came my way, giggling in unison with my girlfriend, and scratching my head as to how, after all these years, the talented folks at EAD Tokyo manage to flip the most tried and tested concepts completely on their head. You never know quite what to expect with SM3DW; there’s genuine wonder and excitement with every step. Thankfully, the music in SM3DW greatly surpasses the rehashed melodies of New Super Mario Bros U. The jazzy overworld theme is a particular highlight, and it won’t be long before you’re tapping your feet and bobbing to the beat. The haunting symphony from the Ghost House level is also a new classic that I hope to hear again, ditto for the music of World 5, which is incredibly infectious. Naturally, it’s not just the music that makes SM3DW complete; every sound effect is lovingly recreated. Whenever you run along a crystallised surface, a rain-soaked ledge or scamper over a sandy beach, every sound is just as you’d hope it would be. Mario and the cast of other endearing characters have lost none of their charm and enthusiasm for adventure, either. Super Mario 3D World is video game entertainment in its purest, most innocent form. Competitors may have veered off on a different trajectory, opting to follow the footsteps of Hollywood blockbusters and the lucrative monetisation model created by the mobile market, but Super Mario 3D World is delightfully steadfast in many respects. This is a game that brings people together in person, huddled on a sofa as opposed to the empty online connection so many of us hide behind today. With each hop, skip, leap and meow, Super Mario 3D World solidifies the fact that Nintendo are still the masters of this medium we so dearly cherish. Put your cynicism aside, because Super Mario 3D World is the cat’s pyjamas.